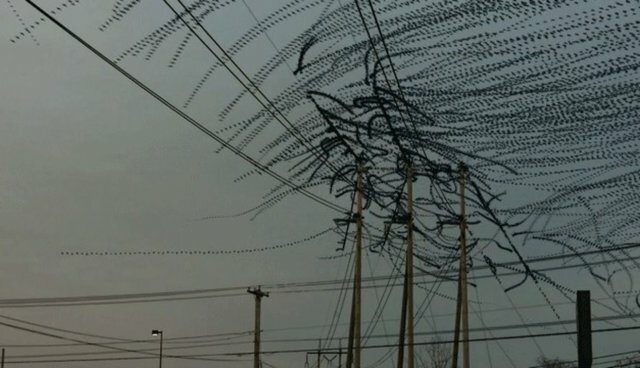 One Rhode Island-based artist has created a series of stunning videos that document the intricate paths of various bird flocks. Using a unique digital process that he calls "extruded time," Dennis Hlynsky captures swallows' sharp dives and vultures' swoops, producing lovely visuals of different murmurations. As Hlynsky explains on his project blog, the animals and patterns captured in his videos can help us understand group behaviors and, he hopes, animal relationships. https://vimeo.com/81624972 https://vimeo.com/78188069 Hlynsky also used a similar process to track insects, which appeared to loop around in equally mesmerizing patterns. https://vimeo.com/81138580 Longer versions of Hlynsky's bird videos are also available on his Vimeo page.